The US leaves the Second World War as a major winner. All old and emerging superpowers are completely exhausted. In Washington they dream of a new world order in which only they are in charge. Unfortunately, the rapid reconstruction of the Soviet Union and the breakthrough of the nuclear monopoly thwart these plans. At that moment, China is not (yet) a threat. The economy is underdeveloped, GDP is only one third of US GDP. Also on the military level the country is insignificant. At that time China is seen primarily as an interesting haven for profits: it has a huge contingent of cheap, disciplined labour and in the long run, with one fifth of the world’s population, it will become an attractive market outlet for Western products. Conversely, China is aiming for foreign investment and the global market in order to develop rapidly. In the capitalist headquarters the illusion is cherished that with the economic opening in China capitalism will irreversibly seep in and eventually take over from the ‘communist regime’. Two birds killed with one stone: favourable prospects for the multinationals on one hand and the elimination of an ideological rival on the other. That’s why China is admitted to the World Trade Organisation in 2001. In any case, joining the WTO is a real boost for the Chinese economy. In 1995 the country ranked eleventh on on the list of exporters of goods. Twenty years later, it is leading the list. Since joining the WTO, the economy has grown fourfold. This is also a win-win relationship for the US. American multinationals are doing excellent business in China. Last year their sales amounted to almost $ 500 billion, which is 100 billion more than the trade deficit between the US and China. The purchasing power of the population in the US is increasing due to the import of cheap Chinese goods. There are also important monetary benefits. In order to keep the yuan linkedto the dollar, China buys a huge amount of dollars, which means that the U.S. obtain very cheap credits and therefore can keep the interest rates low. But, and it is a big ‘but’, regarding an internal capitalist takeover or weakening of the communist party, almost nothing is going as planned. “China’s Communist Party hasn’t been tamed by commerce. The Party-State still has firm control over the commanding heights of China’s economy, both directly, and indirectly, through its influence on large ‘private’ companies, who can only remain both successful and private with the support of the Party” , in the words of economist Brad W. Setser. Capitalist giants, be they financial, industrial or digital companies like Google, Amazon or Facebook, do as they please everywhere. Not in China. It is one of the few places in the world where these giants have little or no control. Furthermore, the Middle Kingdom is no longer a transit country where goods are assembled, thus providing services for which the country itself does not earn much. That China is no longer the playground of large multinationals is bad as it is. But much worse is the fact that the economic position of the US has weakened, while China’s has been enhanced significantly. 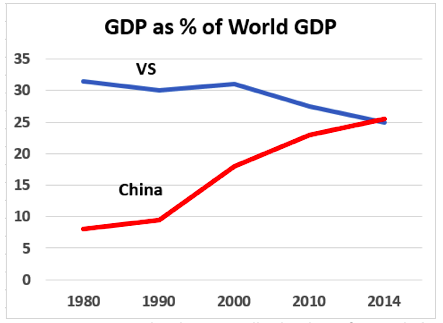 In 1980, the US GDP was one third of the world GDP, while China’s GDP was a little more than one twentieth. Today they both account for a quarter. And, it is not just a quantitative evolution. The Chinese economy made also a qualitative leap forward. A lot of progress has been made in the technological field. Until recently, the country was seen as an imitator of technology, today it is an innovator. Currently 40 percent of all patents worldwide are Chinese, which is more than the following three countries combined: the US, Japan and South Korea. In 2015, the ‘Made in China 2025‘ plan was launched to further innovate the industry and gain more autonomy in ten key sectors. But according to Navarro, it is not just about the economy, prosperity or profits. Navarro’s statements are very revealing. Today the Trump government is making a lot of noise about the trade deficit, but that is not the real concern. What matters is maintaining dominance in three areas: technology, the industries of the future and armaments. This dominance is threatened first and foremost by China. 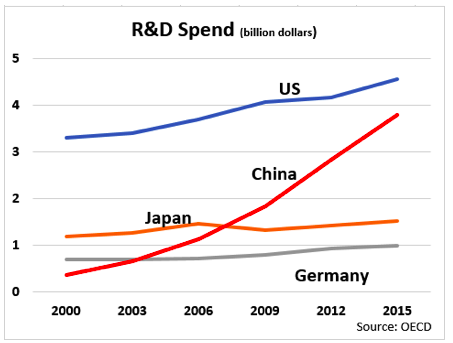 “Chinese R&D spending is rapidly converging to that of the U.S. and will likely achieve parity sometime in the near future”. It explicitly refers to Made in China 2025. But the link between technology, economy and armaments goes even further than that. In order to maintain military dominance, the US needs a solid industrial base of its own. From the perspective of national security, globalisation has gone too far. Delocalisation of parts of the US economy has eroded the basis of the war industry and thereby undermined national security. The protectionist policy of the Trump government is not primarily motivated by trade deficit. The report only mentions this in passing. The trade deficit is a side effect of a deeper problem. What matters is to ensure a “vibrant defense industrial base”, based on a “vibrant domestic manufacturing sector” and “resilient supply chains”. That is “a national priority”. In the twentieth century the main efforts of the US were directed against the Soviet Union, those of the twenty-first century are now focused on the ‘Chinese danger’. In the context of the 2019 budget discussions, Congress stated that “long-term strategic competition with China is a principal priority for the United States”. It is not only about economic aspects, but about an overall strategy that mustbe conducted on several fronts. The approach requires “the integration of multiple elements of national power, including diplomatic, economic, intelligence, law enforcement, and military elements, to protect and strengthen national security”. We restrict ourselves to the economic and military aspects. In order to prevent China’s rise, it is therefore necessary to decouple the US economically from China as much as necessary. Both Chinese investments in the US and US investments in China must be limited and barred. In the first place, strategic sectors are targeted. Most serious observers are convinced that the trade tariffs imposed will have an adverse effect on the US economy and will resolve the trade deficit with China. But that’s not the real concern of Trump and his clique. Their focus “is on trying to disrupt China’s technological rise rather than on doing a deal that’s best for the US economy”, in the words of an investor. The Trump government is also trying to extend its trade war with China to other countries. 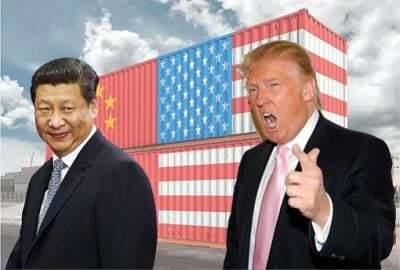 In the recent negotiations with Canada and Mexico on a new free trade agreement, Trump has included a clause stating that these two countries may not conclude a trade agreement with a “non-market economy”, in other words with China. The intention is to sign such an agreement in the future with countries such as Japan, the European Union and Great Britain. If the US succeeds, it will be a hard blow to China and the start of a kind of “economic iron curtain” around the country. The anti-China attitude is not limited to Trump and a few hawks in his government. Large parts of the establishment believe that the US and China are engaged in a long-term strategic rivalry and that the rise of the Asian giant poses a threat to the US position. There is a growing consensus that trade and national security policies should no longer be separated and that the White House should provide a strong response to its strategic rival. The hunger for confrontationis growing. The anti-Chinese mood can be found among Republicans, free market ideologists, national security hawks and people of the Pentagon. But also among Democrats and part of the unions and the left. This means that the hostility towards China will probably be long-lasting and in any case will not disappear with the departure of the current president. The military superiority of the US is overwhelming. It has 800 military bases spread over 70 countries and more than 150,000 troops in 177 countries. Military spending annually exceeds $600 billion, that is more than a third of the world total. It is three times as much as China and per inhabitant it’s even 12 times as much. According to the National Security Strategy of 2017, China is building “the most capable and well-funded military in the world, after our own”. (o. c.) The “other power” Trump is talking about is China. According to the Pentagon, everything must be done to preserve the supremacy in East Asia. That means curbing China. The military strategy towards China has two tracks: an arms race and an encirclement on the country. The arms race is in full swing. The US spends 150 billion dollars a year on military research, that’s five times as much as China. They are feverishly working on a new generation of highly sophisticated weapons, drones and all kinds of robots, which a future enemy will not be able to cope with. The F-35 contains the top technology of the moment and has a lead of about 15 to 20 years over the Chinese jet fighters. In the development of these high-tech weapons, artificial intelligence, quantum mechanics, laser technology, supersonic speeds, nuclear ignitions and electronic warfare play an increasing role. They are the war sciences of the future. The White House’s increasing protectionism is not only about trade, investment or technology, but increasingly also about knowledge. Special attention is paid to space weapons. “If deterrence fails I am convinced … if we are up against a peer or near-peer we are going to have to fight for space superiority,” says General John Raymond, Commander-in-Chief of the Air Force Space Command. Last year Trump decided to establish a new full-fledged department within the army: the US Space Force. A preventive war is not excluded. Bob Work, former Deputy Minister of Defence, notes that China is developing missiles that come close to theirs. “The US has never had to fight against an adversary that has been able to throw as deep as and as dense as the US. The use of guided munitions in any future war will be so widespread and profound” that it will make “a lot of sense to be the one to shoot first”. The second track is military encirclement. For its foreign trade, China depends for 90 percent on maritime transport. More than 80 percent of the oil supply has to pass through the Strait of Malacca (near Singapore), where the US has a military base. Kissinger once said: “control oil and you control nations”. In any case, Washington can easily cut off oil flows to China. Currently the country has no defence against it. 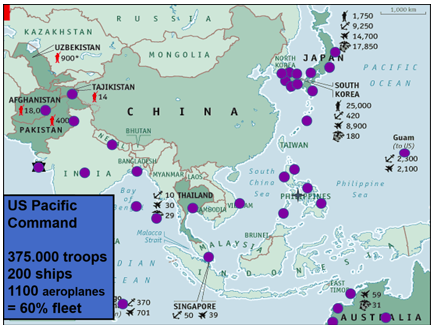 Around China the US has more than thirty military bases, facilities or training centres (dots on the map). By 2020, 60% of the total US fleet will be stationed in the region. It is no exaggeration to say that China is encircled and squeezed. Imagine what would happen if China were to install even one military facility, let alone a base near the US. In this context the development of small islands in the South China Sea should be seen as well as the claims of a large part of this area. Controlling the shipping routes along which its energy and industrial goods are transported is of vitalimportance to Beijing. China is a threat to US supremacy. Will this inevitably lead to a deadly pitfall, first described by Thucydides? This ancient Greek historian explains how the rise of Athens created fear in Sparta and made it go to war to prevent that rise. Historian Graham Allison outlines how in the past 500 years there have been 16 periods in which an emerging power threatened to supplant a ruling power. Twelve times this ended in war. “Capital eschews no profit, or very small profit.” If the profit is large, “capital will produce positive audacity” and if the profit is very large, “there is not a crime at which it will scruple, nor a risk it will not run”. Some will argue that the extermination power of current weapons has become too big to risk a large-scale conflict. But that thought error was already made a hundred years ago according to Katrina Mason. How can the gigantic economic interests be brought under democratic control, so that not profit but common sense will prevail? That is the key question for the future. Marc Vandepitte is a Belgian philosopher and economist, author of numerous books on North-South relations, Latin America, Cuba and China.